Google had introduced Google talk Lab Edition some time back, which according to them was the desktop based client for their Web based Google Talk Widget. They have recently added a new functionality in the client that is remaining Invisible. 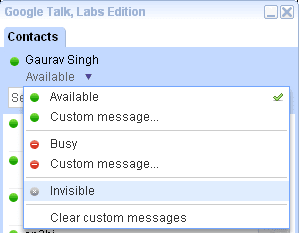 Invisible feature was only available to the Gmail based chats and not for the Desktop based clients but now Google has added Invisible Option to Google Talk Lab Edition too.Which means it is doing something for desktop clients. Still Google Talk Lab Edition is really short of features. No file Sharing, No Voice Chat, But as Pointed at its launch it has the Orkut , Gmail and Calendar notifications. But its good that Google has been doing something for the beloved Google Talk.